The Chiroform mid back 24 hour ergonomic task chair from Allseating stands up to the demands of non-stop usage in even the heaviest work environments. Features include a 325 lb. 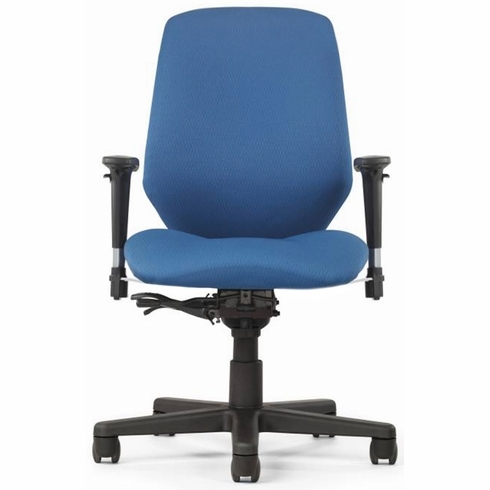 weight capacity, multi-density foam backrest that conforms to your body, reinforced ballistic nylon back that helps prevent fabric rips or tears, contoured seat available in your choice of fabric or vinyl upholstery, pneumatic seat height adjustment, 360-degree swivel, tilt with infinite tilt lock, tilt tension control, forward seat angle adjustment, back height adjustment, back angle adjustment, fixed elastomeric straps that add support to the lumbar area, adjustable height and width T-shape armrests and a heavy duty five star nylon base with dual wheel carpet casters. The Chiroform 24 hour heavy duty task chair meets or exceeds ANSI/BIFMA standards. Dimensions: Back Size: 21"H x 18"W. Seat Size: 19"W x 18.5"D. Seat Height: 16.5 - 22"H. Overall: 37.5"-46"H x 28"W x 28"D. 10 year warranty from Allseating. Normally ships in 3-4 business days from Toronto CA.